“Here’s Johnny!” The immortal image of Jack Nicholson movie in The Shining evokes images of horror. The hotel which inspired the movie evokes the same feelings in a lot of people. 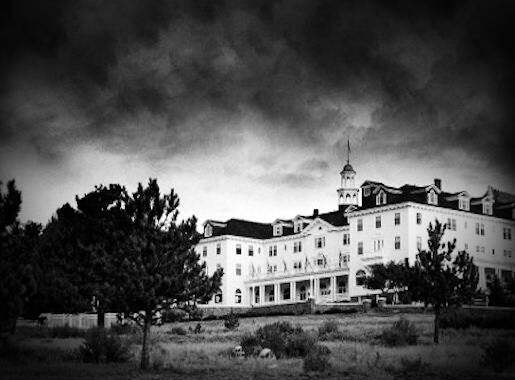 This Estes Park haunted hotel, is supposedly home to numerous ghosts, one being the past owners’ wife Flora. If you’re lucky enough she may just play you something on the piano. Both guests and employees have reported various paranormal phenomena in the hotel. Two of the spirits that are most frequently reported are that of the past owner, F.O. Stanley and his wife, Flora. It is reported that Flora continues to play the piano in the ballroom, which her husband gave her as a gift to celebrate the hotel’s opening. Guests and employees of the hotel have reported hearing music coming from the ballroom on numerous occasions. Several people have also witnessed the piano keys moving on their own. Others have reported actually seeing the apparition of a woman sitting on the bench and playing the piano. Room 418 of the hotel is one which is rife with supernatural activity. The presence of children has been reported laughing and playing just outside the doors of the room. The hotel staff have received several complaints from guests who have heard children playing in the dead of night. Even Stephen King himself has had a brush with the spirit of a little boy in the room. He reported hearing what seemed like a young boy calling out for his nanny. Room 407 is another hive of activity. Several reports are of a spirit who likes turning the lights off and on. Unexplained noises have been reported in the room numerous times. A face has often been seen in the window of the room from guests looking up to the room whilst outside of the hotel. The fourth floor of the hotel has had the most reports of activity, but strange noises, footsteps, voices, and other supernatural occurrences have been reported all throughout the hotel. The hotel is named after its builder, Freeman Oscar Stanley who was popular for the Stanley Streamer. The hotel opened on the 4th of July 1909 and back then it catered to the rich and famous of Colorado and the entire United States. Some of the people who have been to the hotel included the survivor of RMS Titanic, Molly Brown, Theodore Roosevelt, Japanese royalty and countless Hollywood celebrities. The hotel was built on 160 acres of land which Stanley bought from the Earl of Dunraven and Mount-Earl. The hotel’s construction started in 1907. It was built with a Georgian architectural style. During its opening, it had all the high-end amenities that would befit the kind of guests it aimed to attract. It had running water, telephones, and electricity, which was quite the luxury back then. The only thing which it did not have was heating. The hotel was designed as a summer resort, hence the lack of heating. The hotel is a favorite when it comes to weddings. It can make the most memorable day of your life 7,500 feet above the ordinary. The panoramic views of the Rocky Mountains and the historic charm of the hotel will make your wedding day truly unforgettable. The hotel has various unique locations which can allow you to customize your wedding. You will have your own area for farewell brunches, rehearsal dinners, and wedding receptions. The hotels’ Mac Gregor Ballroom can easily accommodate up to 200 guests. The Stanley Concert Hall can seat up to 150 guests in banquet style. The hall has a large stage, dramatic high ceilings and a veranda which overlooks the mountains. The Music Room has arched Palladian windows which frame the splendid mountain views. The stage French doors open up to the two verandas. It can seat up to 80 guests comfortably. The Pinion and Billiard rooms can also seat 80 guests. The connecting rooms lead to the largest fireplace in the state and also have access to the veranda. The Library room can be found in the Manor House and it has a cozy and warm ambiance. It can seat up to 50 guests. There are lots of things to do when checking in at the Stanley Hotel. Aside from enjoying the views of the Rockies, paranormal enthusiasts can join the ghost tour which is offered daily. The Stanley Hotel has lots of attractions nearby which visitors and guests will enjoy. People who love art and history can go to the Stanley Museum, Enos Mills Cabin Museum and the Mac Gregor Ranch Museum. If you love the outdoors, you will be more than satisfied with the Rocky Mountain National Park. You can commune with nature and relax at the same time. You can go hiking and biking by yourself or with your loved ones. The “chapel on the rock” is a must-see. St. Catherine’s Church was designed by Jacques Benedict. It is made out of native stone which was supposedly hulled by mule to the site. If you want to pamper yourself, the Riverspointe Spa is definitely a place to go to if you want to unwind. It has great service and a relaxing atmosphere.